New Hempz Green Tea & Asian Pear Gift Set – 3 pc. Treat yourself or a friend with this gift set containing Hempz Exotic Green Tea & Asian Pear Body Moisturizer, Hempz Sandalwood & Apple Body Scrub and a Hempz Herbal Lip Balm in a mesh gift bag. New Deep Moisture body lotion from Body Drench will lock in moisture all day. Leaves skin soft, smooth and delightfully fragrant with it’s original signature Body Drench scent. Only $9.50! Save 20% now until Tuesday, Sept. 17 with coupon available on our website. Our Top Sellers here at TanForLess! 1. 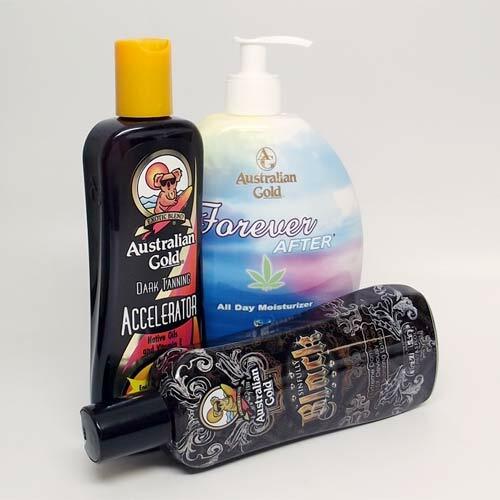 Australian Gold Dark Tanning ACCELERATOR Lotion – 8.5 oz. 2. Australian Gold FOREVER AFTER All Day Moisturizer with Hemp – 22 oz. 3. Australian Gold SINFULLY BLACK Dark Bronzer – 8.5 oz.